RangyPOS the mobile POS solution from Thailand is going to launch in Singapore market during CommunicASIA 2015 event between June 2-5, 2015. 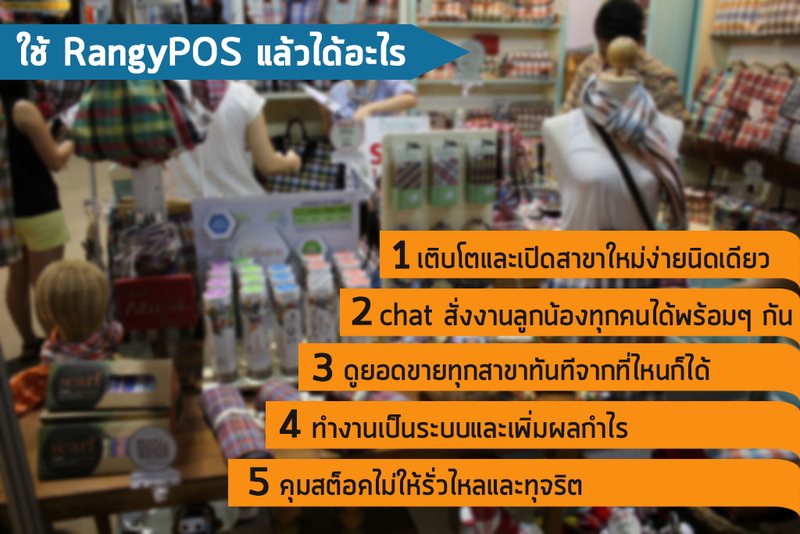 RangyPOS is the new alternative POS solution for SMEs in Thailand to integrate IT into their shop management. In the past, SME would start with a Cash Register machine or a PC POS solution. Both of which have been in the market for many years but with the Post-PC era people are connected on smart phones all the time. So if they could do their works in the shop with their mobile phones, life will be much easier for them. With that idea in mind, RangyPOS was developed and launched in late 2014 in Thailand market. Shop-owners could easily download the RangyPOS app from the Play Store and keep using it for 30 day free trial. Then the company will use monthly subscribtion model. They can open up a shop, create new products, sell products, view daily report, and manage inventory. Every employee could use their own device to connect to the shop and work seamlessly together. This is the new working environment RangyPOS are promoting. Also, openning up a new location is just one click away. It will allow shop-owners to grow even faster and be more competitive. For the past 4 months, the Play Store download is around 2,000 and almost 50% of downloaders created a shop on RangyPOS. Around 4,000 products has been created and sold on the system which accounts for 500,000 USD revenues for them. This is just a start because the team behind RangyPOS have not fully promoted it yet. Rangy is a subsidary company of Nine Net – a leading dental and restaurant POS in Thailand. The team have been transfering knowledge and experiences in retail business into RangyPOS. Shop-owners in AEC could expect more aggressive marketing approaches from RangyPOS in the near future.